Manipulating the flow of energy through superconductors could radically transform technology, perhaps leading to applications such as ultra-fast, highly efficient quantum computers. But these subtle dynamics—including heat dispersion—play out with absurd speed across dizzying subatomic structures. Now, scientists have tracked never-before-seen interactions between electrons and the crystal lattice structure of copper-oxide superconductors. The collaboration, led by scientists at the U.S. Department of Energy's (DOE) Brookhaven National Laboratory, achieved measurement precision faster than one trillionth of one second through a groundbreaking combination of experimental techniques. "This breakthrough offers direct, fundamental insight into the puzzling characteristics of these remarkable materials," said Brookhaven Lab scientist Yimei Zhu, who led the research. "We already had evidence of how lattice vibrations impact electron activity and disperse heat, but it was all through deduction. Now, finally, we can see it directly." The results, published April 27 in the journal Science Advances, could advance research into powerful, fleeting phenomena found in copper oxides—including high-temperature superconductivity—and help scientists engineer new, better-performing materials. "We found a nuanced atomic landscape, where certain high-frequency, 'hot' vibrations within the superconductor rapidly absorb energy from electrons and increase in intensity," said first author Tatiana Konstantinova, a Ph.D. student at Stony Brook University doing her thesis work at Brookhaven Lab. "Other sections of the lattice, however, were slow to react. Seeing this kind of tiered interaction transforms our understanding of copper oxides." Scientists used ultra-fast electron diffraction and photoemission spectroscopy to observe changes in electron energy and momentum as well as fluctuations in the atomic structure. Other collaborating institutions include SLAC National Accelerator Laboratory, North Carolina State University, Georgetown University, and the University of Duisburg-Essen in Germany. The team chose Bi2Sr2CaCu2O8, a well-known superconducting copper oxide that exhibits the strong interactions central to the study. Even at temperatures close to absolute zero, the crystalline atomic lattice vibrates and very slight pulses of energy can cause the vibrations to increase in amplitude. "These atomic vibrations are regimented and discrete, meaning they divide across specific frequencies," Zhu said. "We call vibrations with specific frequencies 'phonons,' and their interactions with flowing electrons were our target." This system of interactions is a bit like the distribution of water through a tree, Konstantinova explained. Exposed to rain, only the roots can absorb the water before spreading it through the trunk and into the branches. "Here, the water is like energy, raining down on the branching structure of the superconductor, and the soil is like our electrons," Konstantinova said. "But those electrons will only interact with certain phonons, which, in turn, redistribute the energy. Those phonons are like the hidden, highly interactive 'roots' that we needed to detect." The atoms flex and shift on extremely fast timescales—think 100 femtoseconds, or million billionths of a second—and those motions must be pinpointed to understand their effect. And, ideally, dissect and manipulate those interactions. The team used a custom-grown, layered bismuth-based compound, which can be cleaved into 100 nanometer samples through the relatively simple application of Scotch tape. The material was then tested using the so-called "pump-probe" technique of million-electron-volt ultrafast electron diffraction (MeV-UED). As in similar time-resolved experiments, a fast light pulse (pump) struck the sample, lasting for just 100 femtoseconds and depositing energy. An electron beam followed, bounced off the crystal lattice, and a detector measured its diffraction pattern. Repeating this process—like a series of atomic snapshots—revealed the rapid, subtle shifting of atomic vibrations over time. After the initial MeV-UED experiments at Brookhaven Lab, the data collection proceeded at SLAC National Accelerator Laboratory's UED facility during the relocation of the Brookhaven instrument to another building. 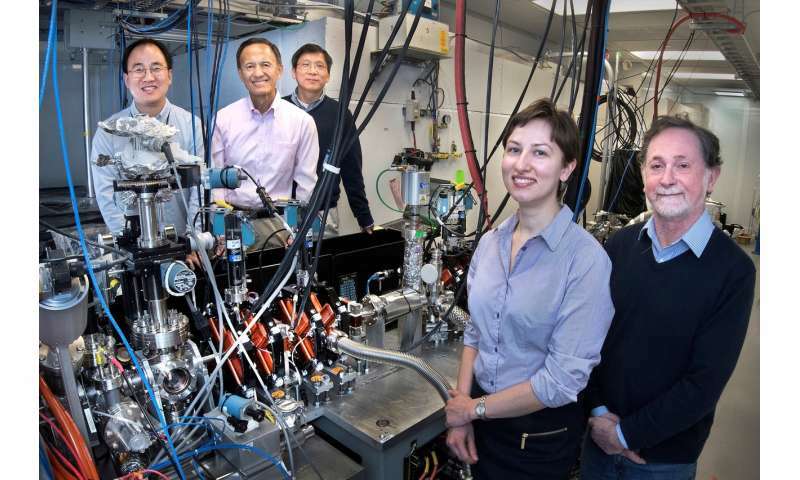 Colleagues at the SLAC UED facility, led by Xijie Wang, assisted on the experiment. The electron diffraction, however, only provided half the picture. Using time- and angle-resolved photoemission spectroscopy (tr-ARPES), the team tracked the changes in electrons within the material. An initial laser hit the sample and a second quickly followed—again with 100-femtosecond precision—to kick electrons off the surface. Detecting those flying electrons revealed changes over time in both energy and momentum. The tr-ARPES experiments were conducted at the facility in University Duisburg-Essen by Brookhaven Lab scientists Jonathan Rameau and Peter Johnson and their German colleagues. Scientists from North Carolina State University and Georgetown University provided theoretical support. "Both experimental techniques are rather sophisticated and require efforts of experts across multiple disciplines, from laser optics to accelerators and condensed matter physics," Konstantinova said. "The caliber of the instruments and the quality of the sample allowed us to distinguish between different types of lattice vibrations." The team showed that the atomic vibrations evident in the electron-lattice interactions are varied and, in some ways, counter-intuitive. When the lattice takes up energy from electrons, the amplitude of high-frequency phonons increases first while the lowest-frequency vibrations increase last. The different rates of energy flow between vibrations means that the sample, when subjected to a burst of photons, moves through novel stages that would be bypassed if simply exposed to heat. "Our data guides the new quantitative descriptions of nonequilibrium behavior in complex systems," Konstantinova said. "The experimental approach readily applies to other exciting materials where electron-lattice interactions are of major interest."